Since 2007, the Na Karmeli Education Centre is a fascinating project that has integrated historical and modern architecture into a distinguished space that can be used to host educational and social events. This new building offers classrooms with modern equipment, meeting rooms, and two lecture halls that can be joined together into a large auditorium. In addition to lectures and discussion fora, film festivals have also been hosted here. 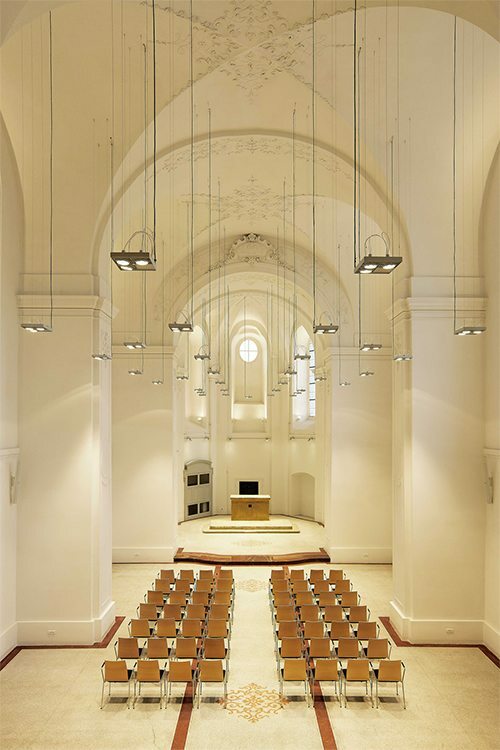 The Church of St. Bonaventure is used for exhibition purposes, fashion shows, and musical and choral productions. Open air events for the public take place throughout the extensive terraces of the Education Centre. The Na Karmeli Education Centre is a place where the past meets the future. For this reason, a monumental timeline was opened here in 2012 that covers the history of the world, the Czech lands, Mladá Boleslav, and automobiles, from 2000 BCE until today. This exhibit is free of charge. Come discover this perfect combination of education and entertainment. In the second half of the 20th century, this complex, whose history reaches as far back as the 13th century, was gradually deteriorating. For seven centuries it had served liturgical and educational purposes as a monastery with the church on Karmel. In the 16th century, for example, one of the most important European centers of the Unity of the Brethren was located here. The church acquired its baroque form at the turn of the 17th and 18th centuries. Both structures owe their current appearance to Škoda Auto, a.s. After extensive renovations the gala opening of the complex was held in September 2007. This church is part of the monastery complex. The date of its founding cannot be determined precisely, but falls most likely in the mid-14th century. It was completely destroyed during the Hussite wars. From the 15th century to the beginning of the 17th century the Bohemian Brethren worked here, where they built their own center with prayer room and other buildings, including towers. At that time the monastery complex was named after the Biblical Mount Carmel. After the Battle of White Mountain, the entire monastery complex fell once again into the hands of the Catholic Order of Friars Minor. The church was reconstructed in the years 1675-1711 in the Baroque style and equipped with period furnishings. Its dominant feature was the high altar with a painting of St. Bonaventure by the painter F. Laubner from 1777. During the Josphinist reforms, the church came into the possession of the Order of Piarists. At the beginning of the 20th century the church (façade and interior) were renovated in a neo-Baroque style. 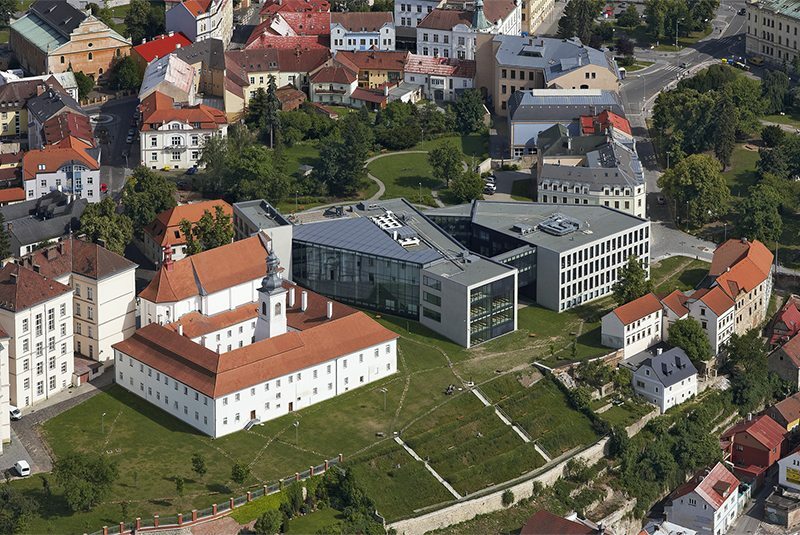 In the second half of the 20th century, the church and entire monastery were deteriorating, and would only see reconstruction in 2006 and 2007 through investment by ŠKODA Auto a.s. 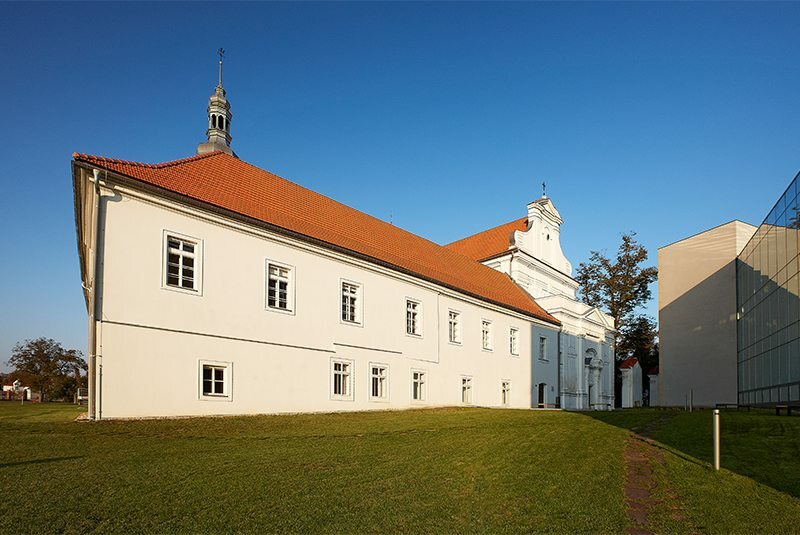 This Piarist monastery, along with the Church of St. Bonaventure, is the only preserved monastery complex in all of Mladá Boleslav. The monastery was founded at the end of the 13th century by the Minorite Order, and was later destroyed during the Hussite Wars (in 1421). Only in the late 15th century (in 1496) was the abandoned monastery donated by Adam of Cimburk and Tovačov to the Bohemian Brethren. The Brethren built a congregation, school, and print shop in this location, and the entire complex became a center for the Unity of Brethren and the site of many important meetings and conferences. In the years 1544-1554 the monastery was repaired and equipped with a renaissance tower, marked with the year 1583. At that time, Karmel was experiencing its own golden age. Mladá Boleslav became one of the most important centers of the Unity of Brethren during the course of the 16th and 17th centuries and became known by the Brethren as Rome or Jerusalem on the Jizera. The members of the Brethren further pursued the spreading of the faith through a novelty of the time – book printing. They first printed their writings in Litomyšl or Nuremburg. All of this changed with the coming of Mikuláš Klaudián, who was not only a member of the Brethren but also a doctor and printer. It was through his contributions that a print shop was established at Karmel (in the building later occupied by the notary office). Klaudián entered the cultural annals of the nation when he published the first printed map of Bohemia in Nuremburg in 1518 (only two copies of the original, richly illustrated cartographic work remain in this country). A Brethren School also existed at Na Karmeli (No. 73/II. ), which at the time surpassed other city schools – the Catholic, Calixtine, and Jewish – with its high standard of quality. In addition to other languages, the Czech language was taught here, and graduates of the institute number among later students of Protestant universities such as those in Heidelberg and Geneva. After the Battle of White Mountain (in 1620), which brought about the downfall of the Unity of Brethren, the monastery was once again allocated to the Carmelite Order, but in 1633 was reacquired by the Minorites. In the 17th and 18th centuries the entire complex was renovated (the four-winged convent around the tapered courtyard was completed in 1767). In 1784 the Minorites had to abandon the monastery and their place was taken by the Piarists, who moved their preparatory school and dormitory here from Kosmonosy. The Piarists ran the school until the year 1862, when education fell under the competency of the government. In 1868 teaching began in a newly built preparatory school on Komenského Náměstí (the modern building 1. ZŠ). During the period of management by the Order of Piarists (1784 to the 1960s), an extensive school archive and rich library were located here, including many rare first copies of incunabula, a designation used to describe the oldest printed works from Europe from the origin of book printing, i.e. letterpress (around 1450 and the end of the 15th century). In 1862 education was transferred to the competency of the state. For some time thereafter the church provided religious services for the student body of the secondary school and housed certain members of the order, who worked in the school as teachers and professors. The last resident monk, a Piarist by the name of Cyril Žampach, lived at Na Karmeli until the 1960s. He taught religion and was the caretaker of the school library in the monastery (which contained up to 6,000 volumes), now located in the State District Archive in one of the towers of Mladá Boleslav Castle. Some of the most valuable printed volumes were accidentally discovered during the renovation of the monastery in 2006, in a room beneath a wooden floor. 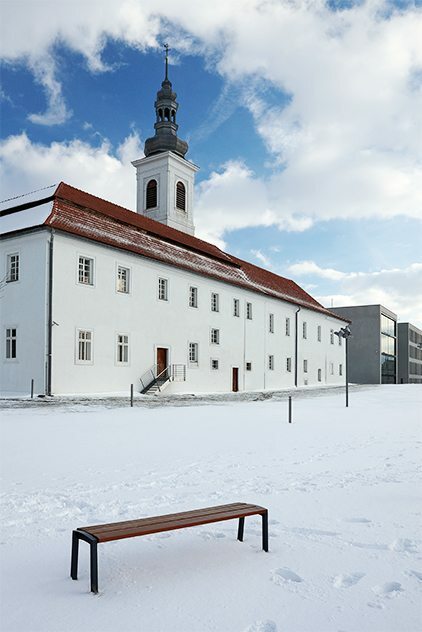 The modern Education Center is one of the most unique combinations of a new building with a historic church and monastery. This new building offers classrooms with modern equipment, meeting rooms, and two lecture halls that can be joined into a large auditorium. In addition to the classic and specially equipped classrooms, the complex also offers a media center, library, and its own dining hall. 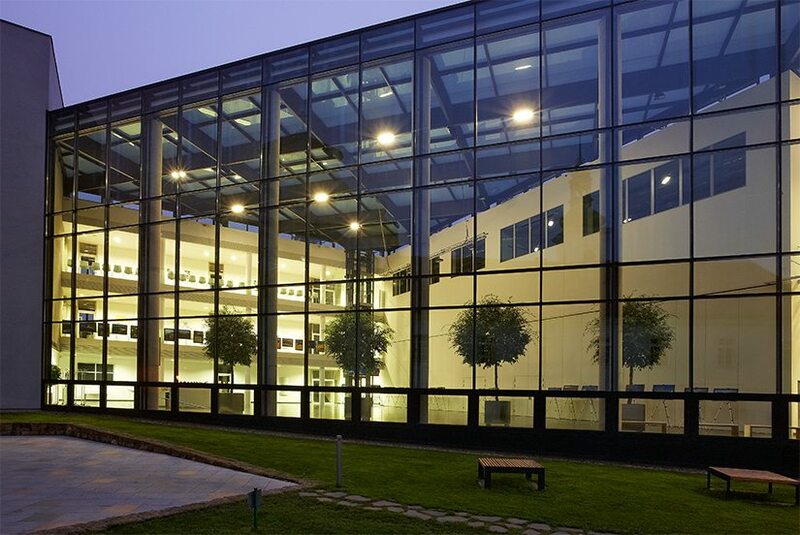 Roughly one third of the complex is leased by Škoda Auto Vysoká škola, o.p.s., while other areas of the structure are used by certain technical divisions of ŠKODA AUTO. The Na Karmeli Education Center is a place that joins the past with the future. This fact is documented by a monumental timeline that includes the history of the world, the Czech lands, Mladá Boleslav, and automobiles from 2000 BCE until today. Come see for yourself. The standard visit lasts 1 hour according to the updated Service Visitor of the ŠKODA Auto Museum.